Media theory has a problem with the new. The new is an obstacle, it is obsolete, it is yesterday’s news. Of the many responses to a late 20th century obsession with “new media,” current attempts to rethink the dominant historical narrative of media culture best encapsulate the problem. This disruptive set of methods and approaches has come to be known as media archaeology (Huhtamo and Parikka 2011). For figures associated with the emergent field, such as the German theorist Siegfried Zielinski, conventional histories of media are too selective, too closely aligned to a restrictive linear progression from past to present. For Zielinski, the unquestioned authority of this narrative produces a problem with the term media itself. Media becomes aligned to the spectacle of progress, synonymous with the bright universal future (Zielinski 2006: 32). In […After the Media] News from the Slow-Fading Twentieth Century, Zielinski employs archaeological methods to reexamine media after the future. As he makes clear from the outset, this is not motivated by paradigmatic posturing but by the urgent need to redeem media criticism at a time of crisis. Appropriately, he begins in polemical terms. We are told that the radical and revolutionary promise of media technologies has proven ersatz. Our current state of permanent connectivity should instead be understood, in Foucauldian terms, as a dispositif, which is to say that media are now “practical constraints,” cultural techniques at which we are required to become adept. In the 21st century, media takes the form of socially anesthetizing routines which “are at the greatest possible remove from what whips us into a state of excitement, induces aesthetic exultation, or triggers irritated thoughts” (19). As he later says, for today’s “digital natives” technology is simply a set of commodities, it has little experimental attraction. The result is ossification: a state of “stabilized boredom” in media thinking and practice (20). Importantly, Zielinski considers media education to be entirely complicit is this situation. In the tragic reduction of multiple interdiscursive practices to a state of institutional discipline, the middleness of media has been lost. Consequently, he argues, contemporary criticism requires a different perspective, “a profoundly dislocated point of view” (21) that works in opposition to the comfort of the disciplinary center. Elsewhere, Zielinski has similarly described a “deep time” perspective, a political maneuver aimed at salvaging difference from homogeneous history and bringing this variation into a relationship of tension with the present. In this, he is influenced as much by Benjamin and McLuhan as he is by the paleontologist Stephen Jay Gould, from whom he adapts the concept of deep time. However, similar strategies are not entirely unfamiliar to other areas of media theory. For McKenzie Wark, “high theory,” or media and cultural theory proper, is paralyzed by the disappointments of failed revolution, by the collapse of the future. A traumatized, grief-stricken victim of a bloody defeat, high theory does little more than sift through its own ruins, piecing together its dismembered remains (Wark 2011: 156). In response, Wark calls for “low theory,” for a theory that draws on forgotten figures and repressed events, theory as political tactic for exposing false promises, for revealing “the void between what can be done and what is to be done” (ibid.). Zielinski describes this opposition as one between the general and particular, between the media and media. In his account, the media is a strategic generalization of variable and competing discourses into a single discursive mechanism. Yet, he insists, simultaneous to this, media (without definite article) has always been practiced by certain individuals and small groups—media as radical experiment. This is media that belongs “to the resistant particularities, to the free-floating singularities”, all of which means that the theorist’s job is to reveal such singularities by excavating “the machinery of the systemic” (24). In […After the Media], Zielinski does this by setting aside his typically “deeper” perspective for an “aerial” viewpoint of 20th century history in which the past is viewed “not as a collection of retrievable facts but as a collection of possibilities” (14). The book is conceived as a swift flight across such possibilities. Accordingly, Chapter 1 takes the form of a one hundred page tour d’horizon, a rapid genealogical expedition to map the ways in which media has been conceived over the last seventy years. Zielinski does this by identifying certain years that appear to have magnetizing properties—these were moments of intensity in which radical possibilities became repressed by the media. He initially presents these moments as hand drawn clusters of names, diagrams in which canonical figures come into collision with unconventional or dissenting individuals. Attracted by the pull of 1948, the year in which Norbert Wiener defined cybernetics, Claude Shannon and Warren Weaver are diagrammed with, among others, John Cage, Mark Rothko and Hans Bellmer. In 1961, the year the Berlin wall was constructed, Noam Chomsky and Roland Barthes are brought together with Felix Guattari, Alain Robbe-Grillet and William S Burroughs. And so on. In a journey in which relations and linkages are not immediately obvious, the chapter begins with cybernetics and ends with Baudrillard’s simulacrum, interspersing the usual Anglo-American trajectory with less familiar accounts of the academic, art and scientific scenes in Germany. 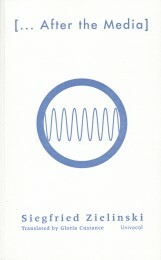 In Chapter 2, Zielinski offers an “operational” development of his methodology, aimed at engaging with “the history of the special frictions between the arts, sciences, and technologies” (127), in order to map a certain cultura experimentalis—a culture that confronts the “functional circuits” of the media with other possibilities (162). As indicated by the dense constellation of names that appear earlier, part of Zielinski’s attempt to map this frictional between-space involves a search for artists who grasp the particular in opposition to the general. Initially, this involves a series of new clusters, and an extended commentary on the work of Nam June Paik. But it also allows Zielinski to better define his schema of different relational qualities. He outlines this, first, in terms of art with media, a situation familiar to the instrumental relationship produced by the communication and entertainment industries. Second, he refers to art through media, in which he excavates the experimental origins of media that is now disciplinary and algorithmic. And, third, he calls for art after the media, here carefully distinguished from reactionary fantasies of flight from, or rejection of technical media, in favor of an engagement with media in a newly reflexive manner. Finally, though, he emphasizes that any truly experimental culture must draw on techno-receptive art before the media. This archaeological conception of the past is less concerned with what has been, with actual media, than it is with what might have been, with imaginary media: “If I am looking to extract options from the future, then I have to grant the past the right to exist in the subjunctive” (133). Frustratingly, though, Zielinski’s method fails to generate the friction that is promised. Brief glimmers of oppositional figures are quickly lost amidst historical layering. His dizzying excursion through the 20th century certainly avoids high theory’s hermeneutic trap by mapping out particular intensities;, but for all his insistence on experimentation, on the development of profane rather than sacred relationships with media (261), Zielinski tends to glide along a familiar surface, pausing only occasionally to uncover something obscured from view. He does acknowledge the subjective nature of his technique, but his insistence that there is more to this method than personal selection never quite stands up to scrutiny. Indeed, the danger with his method is that decisions about what to sweep past and what to dwell on often appear to be motivated by little more than opinion and prejudice. Style is undoubtedly an issue here, and Zielinski’s references to philology, computer writing, and cut-ups reveal that style is something he takes seriously. Yet, on occasion, the consequence of this style is an insensitivity to the actual differences between theoretical positions. For example, in his hurried passage through Italian Autonomist thought, Hardt and Negri are lumped together with Maurizio Lazzarato, Paolo Virno and Matteo Pasquinelli, but the important subtlety of their differences is missed. Furthermore, though Zielsinki contributes to important and ongoing attempts to demonstrate the exclusion of German media theory from the discipline’s Anglo-American narrative (indeed, media archaeology itself is nothing new, and Zielinski charts the misfortunes of German research that, decades after its original publication, still awaits translation), he sometimes gives the impression that redressing this balance is akin to settling scores. In Chapter 3, Zielinski’s journey traverses 21st century media theory. Here, he reserves his most trenchant critique for obscurantism, “merry postmodern transgression” (201), and the naïve techno-utopian rhetoric of cyberculture. He also targets canonical figures of new media, including Geert Lovink, founder of nettime, and Lev Manovich, author of The Language of New Media, accusing the latter of employing a bogus historical method and merely repackaging existing ideas in a form easily marketable as media studies handbook. There are, understandably, more appreciative nods toward the work of Manuel DeLanda, who is noted for his own method of non-linear history, and some positive words for contemporary theorists who directly address the social consequences of continual connectivity. This last point becomes the focus for Chapter 4, in which Zielinksi addresses the integration of cybernetic logic into “a psycho-social context” (244). Here, psychopathia medialis is figured as a technological unconscious, a state of “existing” that amounts to “little more than engaging in technology-based communication” (251). Again, Zielinski’s response is to call for a reflexive state of “being,” a state that is attuned to “the interwovenness of its communicative activities and in a broad sense can realize itself relatively independently from them without adhering to any disastrous notions of essential unities” (251). However, his insistence on this point highlights a contradiction that runs throughout his work. As he argues elsewhere, the problem with any discourse of technological progress is that such accounts overlook the fact that technology is “deeply inhuman” (Zielinski 2006: 6). This means that being or becoming “after the media” must also take place after the human, after an anthropocentric conception of media and mediation. And yet, Zielinski’s archaeological approach—based, as it is, on disrupting a dominant narrative of invention by excavating the suppressed histories of great men—remains a thoroughly human centered exercise. In the end, where Wark proposes low theory as a negative tactic, one that confronts absence, impossibility and paradox, Zielinski tends to affirm alternative layers of an otherwise familiar story. Indeed, even if we were to ignore this impasse and celebrate the inclusion of figures previously absent from Anglo-American media studies, the fact remains that many of these figures are simply not profane enough. As a case in point, Zielinski offers the work of Jake and Dinos Chapman, darlings of what was once called the Young British Art scene, as exemplars of radical experimentalism. He commends their iterative techniques of acceleration, transgression and excess as tactical incursions into history, as defamiliarizing assaults that provoke a subjunctive perspective on the future. And yet the ironic detachment and humor of the Chapman brothers’ most recent work not only anesthetizes any residual capacity to shock, but aligns their work far more closely with the glib ironies of the postmodern Zielinski so derides than it does with the properly reflexive practices of the modern he venerates. In this, the idea that the Chapmans maintain some kind of insurgency from within the art world is unconvincing to say the least. If Zielinski directs us to look here for signs of a contemporary avant-garde, then it seems clear we will find only a neoliberal avant-garde, an avant-garde fully immanent to the flows of the market. If he believes there are other more genuinely radical forms of contemporary practice, forms that exist outside of the gallery circuit, then he gives no indication as to what these might be or where we might look for them. Perhaps the book’s closing manifesto, “Vademecum for the Prevention of psychopathia medialis,” is aimed at bringing such practice to the surface. Ultimately though, there is little sense as to whom such a declaration is addressed and Zielinski’s final gesture obfuscates as much as it rouses. As the tour comes to an end, his passengers are left stranded.. So after the aftermath, after the postmortem of the new, does media archaeology really open up alternative ways to make media, or, as Wark (2014) has recently asked, “is it just a way of filling the scholarly archive with more and more stuff?” After racing through the rags and refuse of contemporary media culture, it remains unclear to what extent we are after the media, or whether this remains an as yet unrealized goal. Huhtamo, Erkki, and Jussi Parikka., eds. Media Archaeology: Approaches, Applications and Implications. Berkeley, CA: University of California Press, 2011. Print. Wark, McKenzie. ‘Where Next for Media Theory?’ Public Seminar 9 April. 2014. Web. 3 June. 2014. Wark, McKenzie. The Beach Beneath the Street: The Everyday Life and Glorious Times of the Situationist International. London: Verso, 2011. Print. Zielinski, Siegfried. Deep Time of the Media: Toward an Archaeology of Hearing and Seeing by Technical Means. Cambridge, Massachusetts: MIT Press, 2006. Print. Dr. Rob Coley is a lecturer in media theory and practice at the University of Lincoln, UK. He is the author, with Dean Lockwood, of Cloud Time: The Inception of the Future (2012, Zer0), and with Adam O’Meara and Dean Lockwood, of Photography in the Middle: Dispatches on Media Ecologies and Aesthetics (forthcoming on Punctum Books). Rob is a founding member of The Society for Ontofabulatory Research.